Although nearly every sunscreen company has there own preferential methods of installation, and they all may claim that theirs is the best sun screen installation method, there are several proper and improper ways to install a sun screen on a residential home. All methods of installation have their positives and negatives, and there is no one answer for every job. Some clients know exaclty how they would like their screens to be mounted, and others would prefer to trust the judgement of the professional to decide which screen installation process best suits the application. The most common screen installation process is to use what are known as “Sun Screen Barrel Clips” to install the screen on the exterior of the window. This application is a surface mount screen that overlaps the window frame while leaving just enough room for the “Barrel Clips” to be drilled into the metal surrounding frame. A 7/16″ barrel clip best mounts with a 1″ self tapping screw that can be either 1/4″ hex driven, or philips head. Once the “Barrel Clips” are secured, the screen can be put into place, and the clips can be turned so that the flat part of the clip secures over the face of the screen frame. It is best to snug each of the mounting screws by hand to ensure a tight fit, yet not to overtighten, and accidentally strip the aluminum window frame hole. As with every method of screen installation, it is most important to be sure that any and all mounting hardware and screws are not placed in a location that will either break or cause damage to the window glass or seal. It is up to the professional to determine the engineering of the window, and decide whether it is safe to drill. A less common, but sometimes necessary method of window screen installations is to use 1″ self tapping screws for a direct mount application. 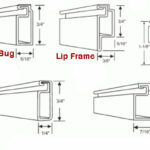 In this case, the screen is simply mounted directly to the window frame with screws that pass through the screen frame. This method is sometimes used when there is just not enough room for the barrel clips, and in order to have full coverage without gaps on the sides or top of the window screen the screen frame has to cover all of what window frame is there. Although it makes it slightly more difficult to remove for cleaning, it is also the most sturdy and sound method of installation, in that, it will not come off the window unless you take it off. All of the same safe drilling practices are suggested when executing this method of window screen installation as well. Those are two of the most common methods of sun screen installation in Phoenix. 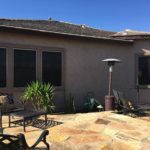 There are many other variations of installations for window screens that can be discussed, and all of them are equally as relative to deciding which you would prefer. Feel free to call Screens Unlimited LLC at (623)399-4942 to discuss your options, or wait to see some of our other blog posts as well.